The anticipation for Agnetha’s new album A, and the staggered release of her new songs (not to mention the leaking of other songs), made me recall the anticipation in late 1976 for ABBA’s album Arrival, and it shows what a different place the world is today. Here in Australia Arrival was the anticipated event of the latter half of 1976. In the months leading up to its release we got our first taste in July when ‘Dancing Queen’ was shown on the television special ABBA In Europe (the German Musikladen special The Best Of ABBA retitled). The single ‘Dancing Queen’/’That’s Me’ followed soon in August, though it seemed an eternity. During the next few months there were many reports in the newspapers telling us about the songs recorded for the album, including “a Hawaiian-sounding song”, an instrumental entitled ‘Ode To Dalecarlia’, and other intriguing titles such as ‘I Am The Tiger’ and ‘Money, Money, Money’. In October we had back-to-back television specials featuring songs from Arrival. First we had ABBA In Sweden (a repackage of the Musikladen special), which previewed ‘Money, Money, Money’, followed a couple of weeks later by ABBA From The Beginning (an edited version of the Swedish special ABBA-dabba-doo!! ), which included nine songs from Arrival. We all recorded the songs on cassette from the TV, often by holding a microphone in front of the speaker. We had no other option to get these songs we had not heard before that had not been released. My friends and I would get together and listen to these low-fi cassettes over and over, engrossed in the new ABBA songs. We would copy these cassettes for other friends who had not recorded them from the TV themselves. A week or so before Arrival was released a local radio station played all the songs from the album, one every hour for an entire day. But this was on a school day!!! How would I get to hear the songs? I hid my transistor radio in my coat pocket, running the earphone up through a hole in the lining, so I could surreptitiously listen during school. Luckily some songs were played during recess and lunch breaks, which made it easier to listen, and a group of us would huddle around the radio. No teachers questioned why I was wearing a heavy coat on a hot November day! I kept note of each song played in each hour. I’d already heard ten eleven of the eleven songs by then (in Australia and New Zealand ‘Fernando’ was added to Arrival on side B, between ‘Why Did It Have To Be Me’ and ‘Tiger’), but this was the first time I heard “the title track”, as it was referred to every time it was played. I probably still have that piece of paper somewhere. But where were the Hawaiian-sounding song and ‘Ode To Dalecarlia’ that we’d heard about? 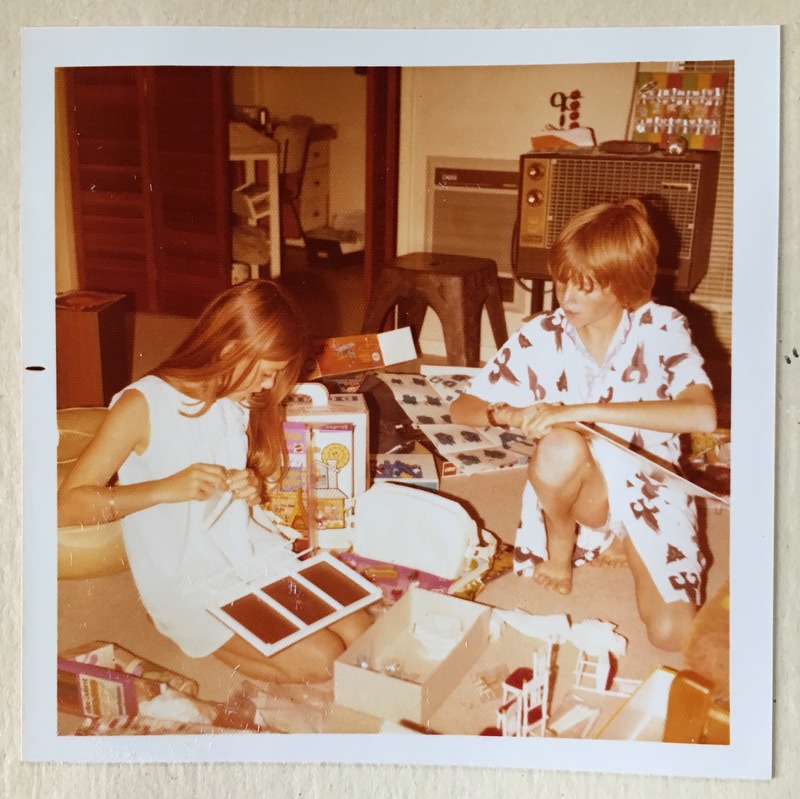 As it turned out ‘Happy Hawaii’ wasn’t included on Arrival, but released as the b-side to ‘Knowing Me, Knowing You’ in February the following year, and ‘Ode To Dalecarlia’ had been retitled ‘Arrival’. There were no leaks of songs, and if unheard songs were broadcast overseas we would only hear them if we were lucky enough to have a pen friend who could send a cassette, but that would take weeks by mail. Arrival was released in Australia on Monday November 15th. I had the album pre-ordered from my local record shop, which got its delivery of albums on the Friday before, and put them on sale immediately! So I was lucky and got the album three days earlier than expected. Finally I got to hear all the songs in the proper stereo glory, not on those buzzy mono cassettes recorded from TV. This coming Sunday (September 25th) I will be in Canberra, joining Allison and (I hope) Luke in the studio for Gimme Gimme Gimme, the weekly ABBA radio show on 2XX 98.3fm Community Radio. Not only that, but we’ll be talking to Donnie Sutherland, host of Channel 7’s Saturday morning music show Sound Unlimited (later called Sounds) from 1975 to 1987. Sounds was on air during the famous period of ABBA mania, but also continued to support ABBA when the bubble burst and the rest of Australia seemed to turn on ABBA. If you’re outside Canberra, in Australia or anywhere in the world, you can listen to live streaming at 2xx’s website between 5-6 pm Australia Eastern Standard Time (7-8 am GMT, 3-4 am US Eastern – check here for your local time). Chat with us and other listeners during the show on Facebook. Thirty-five years ago this week ABBA’s classic single ‘Dancing Queen’ and ‘That’s Me’ was released. Today ‘Dancing Queen’ is recognised as the most popular ABBA song, and ABBA’s biggest selling single. It’s been described as a chart topper in most countries it was released; it was ABBA’s only number 1 on the US pop single charts. ‘Dancing Queen’ had its public debut in June 1976 at a televised gala concert commemorating the wedding of Sweden’s King Carl XVI Gustaf to German-born Silvia Sommerlath. This led to a widely held assumption that ‘Dancing Queen’ was written specially for the occasion. But Ms. Sommerlath at 33 was hardly “young and sweet, only 17”, and in fact ABBA had started work on the song over 10 months earlier. 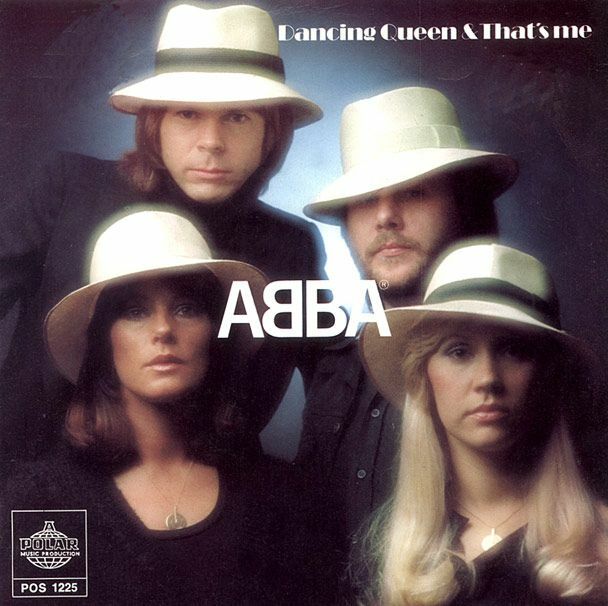 Another modern myth is that the ‘Dancing Queen’ was rush-released after the wedding, but it was long scheduled as ABBA’s next single, for an August release. Recording started in August 1975, around the same time as ‘Fernando’. In early 1976 ABBA and their manager Stig Anderson had the difficult choice of which song to release as a single first. 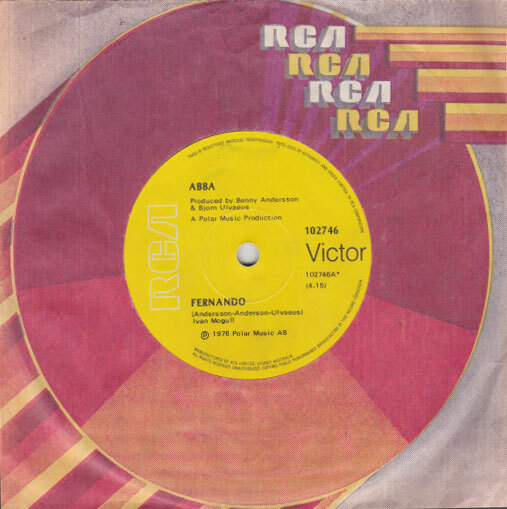 ‘Fernando’ was selected because it was a ballad that was different from the previous international single (the upbeat ‘Mamma Mia’), and because ‘Dancing Queen’ was considered such an advance for ABBA. I first heard about ‘Dancing Queen’ just after ABBA’s first visit to Australia in March 1976. Newspapers reported that while the group was in Australia filming the television special The Best of ABBA (aka ABBA in Australia, ABBA Down Under) they filmed “under strict security” a performance of the next single ‘Dancing Queen’, which would be released the following August. The reports described the song as “disco-influenced”, that it was the best thing ABBA had recorded so far and predicted it would be a huge hit. Many fans outside Sweden (including me) heard ‘Dancing Queen’ for the first time on the German TV special The Best Of ABBA (a different programme from the Australian special of the same name; the German special was renamed ABBA in Europe for Australian viewers), which was screened in June and July in some countries. The B side ‘That’s Me’ was another new song from recording sessions earlier in the year. 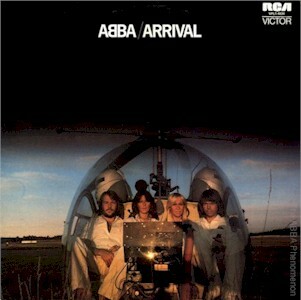 Both songs would be included on the Arrival album, released in October 1976. ‘That’s Me’ would go on to be a hit in Japan as a single in its own right. ‘Dancing Queen’ became ABBA’s signature song, and was used as the encore song in ABBA’s concerts in for the rest of their career together. ‘Dancing Queen’ was released on 6 August 1976 in the UK, 9 August in Australia, 16 August in Sweden, but not until early 1977 in the USA. See the rest of the entry for various TV performances of ‘Dancing Queen’ mentioned in this post. 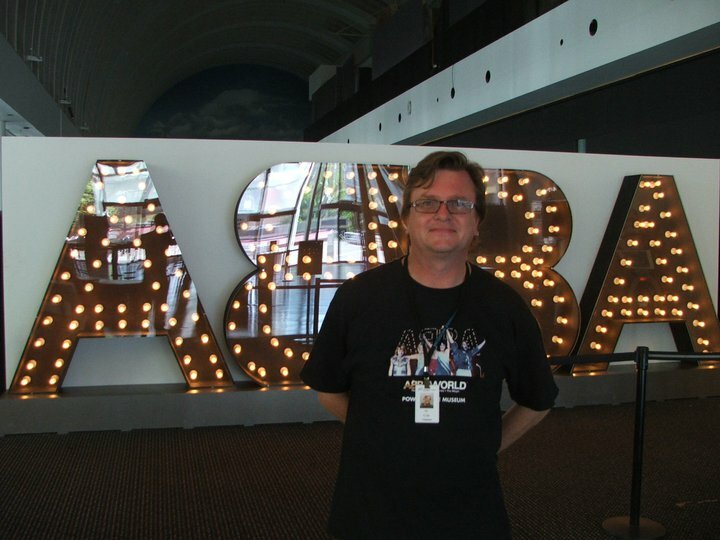 Since mid-December I’ve been lucky enough to work as a volunteer at ABBAWORLD at the Powerhouse Museum in Sydney. The Powerhouse Museum, like many similar institutions, has a large volunteer workforce. When ABBAWORLD was announced late last year the call went out for ABBA fans to work as volunteers at the exhibition, to help visitors, answer questions and share their knowledge and love of ABBA. Many ABBA fans answered the call, with fans working almost every day of the week for the duration of the exhibition, which is scheduled to close on March 6th [update: now closing June 26th]. It’s a fan’s dream come true, to get to work all day talking about ABBA, listening to ABBA music, watching ABBA videos (including all those exclusive interviews) and hanging out close and personal with ABBA’s costumes and other artefacts. It’s so enjoyable to see so many visitors having so much fun. And if you visit ABBAWORLD, say hello to the fan volunteers. They’re the ones wearing the badge that says “ABBA question? Ask Me”. ABBA Treasures – A Celebration of the Ultimate Pop Group is a new book for your ABBA collection, to be released in November 2010. ABBA Treasures is written by Elisabeth Vincentelli, a French-born writer who now lives in the USA. 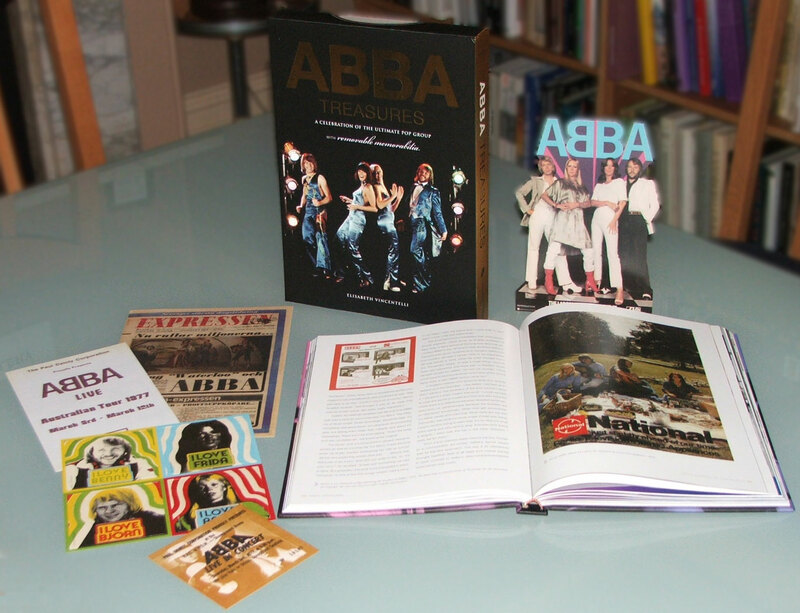 Like other “treasures” books ABBA Treasures is a pictorial biography of ABBA, with reproductions of original memorabilia, such as concert tickets, tour programmes, newspapers, photographs, promotional items and more, housed in sleeves that allows them to be removed. Many fans would have only seen photos of some of these items, so it’s fun to see them for real, albeit in reproductions (some of which are smaller than the original items to fit in the book). The book is lavishly laid out and fully illustrated, with (to my eyes) many rarely seen if not previously unpublished photographs. Those fans overly familiar with the ABBA story probably won’t find anything “new” in the text, but there are some unique insights, and many people including Björn and Benny granted interviews to the author especially for the book. It’s a an honour for me to have been interviewed for the book, and it’s also a pleasure to see my friends Pepé, Roxy and Brian provide the wonderful memorabilia included in the book. Elisabeth is the chief drama critic for the New York Post, and was previously music editor and then arts and entertainment editor for Time Out New York. She has also written for Rolling Stone, The New York Times, Los Angeles Times, Entertainment Weekly, and The Village Voice, and many other publications. She is the author of the 2004 book ABBA Gold, in the 33⅓ series of books on classic albums, and has also written the essay for the forthcoming re-release ABBA Gold – Greatest Hits CD/DVD Special Edition, also due out in November. Some fans may grumble about some reversed photographs or incorrect photo captions, but I don’t think that detracts from the overall enjoyment of the book.